More than 500 runners and walkers participated in the first IRIS 5K Turkey Trot held on Thanksgiving morning at the Shattuck-St. Mary's Sports Complex. Sergio Silva of Faribault won first place in the men's category with a time of 20:06. Haley Lund of Faribault won first place in the women's category with a time of 21:35. "Participants came from all over Minnesota and the United States including Colorado, Illinois, Wisconsin, Texas, Michigan, New Mexico, Arizona, Missouri and North Carolina," said Deanna Kuennen, Turkey Trot coordinator. "We had children that where 2 years old running in the Kids Fun Run and adults in the 5K timed run and 5K walk that where in their 70s and 80s, the turnout was incredible," said Diana Sundwall, IRIS executive director. 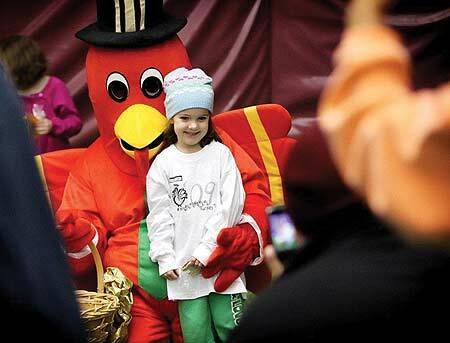 "The committee and volunteers have already begun making plans for the 2010 Thanksgiving morning Turkey Trot." More than $16,000 was raised. All funds raised benefit Infants Remembered In Silence Inc. Results for the 5K timed run are available at www.irisRemembers.com, along with more information on IRIS and other IRIS services. Pictured is Sue Reuvers from Faribault, as "Trot" the turkey mascot, with one of the participants at the IRIS 5K Turkey Trot.